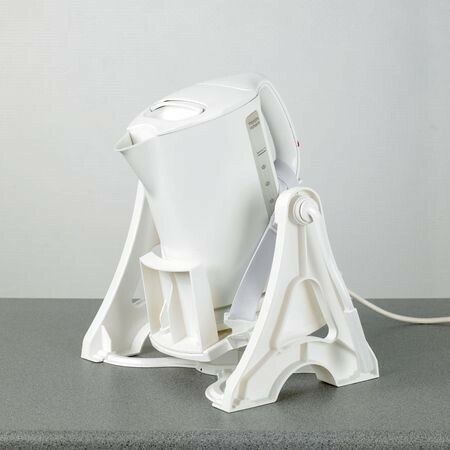 This new and innovative kettle tipper is designed to be compatible with most kettle types including standard, jug and cordless kettles. The lever can be positioned on either side of the tipper to tip the kettle while it is held in place, without the user having to actually lift the water. This reduces the effort required and potential strain on the wrist that can occur when holding the kettle handle. For added safety the kettle will rock back into the upright position if the user lets go during use. The base plate is 200mm in diameter and has a sliding stop at the front so that the kettle can be positioned in the most suitable position. It is then secured in place by the two sturdy straps.